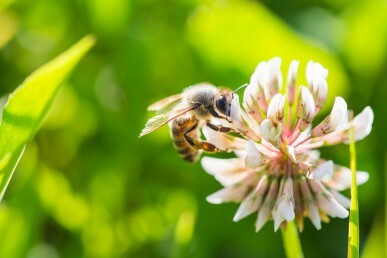 An antimicrobial compound made by honeybees could become the basis for new antibiotics, according to new research at the University of Illinois at Chicago. No new antibiotics have been discovered for more than 30 years, and some bacteria are becoming immune to the drugs used to treat or prevent infections. Antibiotic resistance, called one of the world’s most pressing public health concerns by the Centers for Disease Control and Prevention, can mean illnesses that were once easily treatable are now potentially deadly. Each year in the U.S., at least two million people become infected with bacteria that are resistant to antibiotics, and at least 23,000 people die each year as a direct result of these infections, according to the CDC. Many more people die from other conditions that were complicated by an antibiotic-resistant infection. In a new study published in the journal Nature Structural & Molecular Biology, UIC researchers, led by co-investigators Alexander Mankin and Nora Vázquez-Laslop of the College of Pharmacy’s Center for Biomolecular Sciences, explain how a derivative of the antibiotic apidaecin — Api137 — can block the production of proteins in potentially harmful bacteria. Many antibiotics kill bacteria by targeting the ribosome, which makes all the proteins in the cell. Protein production can be halted by interfering with different stages of translation — the process by which DNA is “translated” into protein molecules — Mankin said. Api137 is the first known inhibitor of translation termination, he said. Api137 is a natural product produced by bees, wasps or hornets. In nature, many organisms defend themselves from infection by making antibacterial peptides, or small proteins. The peptides can be used as antibiotics if “we understand how they work,” said Tanja Florin, a UIC doctoral student who served as one of the lead authors on the paper. Co-authors include Dorota Klepacki, UIC; Marina Rodnina, Cristina Maracci and Prajwal Karki, Max Planck Institute for Biophysical Chemistry, Gottingen, Germany; and Daniel Wilson, Michael Graf, Otto Berninghausen and Roland Beckmann, University of Munich, Munich, Germany. The research was funded by grant R01 GM 106386 from the National Institutes of Health; iNEXT project 2259; grants of the Forschergruppe FOR 1805; and a project grant in the framework of the Sonderforschungsbereich SFB860 from the Deutsche Forschungsgemeinschaft.